Product Hunt, the product aggregation site known for putting new tech products to a vote went off its regular tech product vertical today with the launch of Snoop’s new “Bush” album and a coinciding AMA with the rapper. Snoop spent several hours chatting with fans about everything from buying “house shoes” with bitcoin and the best way to support artists to how he likes his eggs (with bacon). There was also a mention of a wish to travel by way of Submarine at one point in the conversation. People made pictures. Product Hunt founder Ryan Hoover has hinted before that the platform would be getting into verticals that went beyond tech, and while Product Hunt has listed items outside the tech vertical like Ship Your Enemies Glitter (the only tech thing about shipping glitter to someone is the website order form required to do it) or even Drake’s latest album, this is the first example we have of Product Hunt purposely working with anyone in a non-tech vertical. 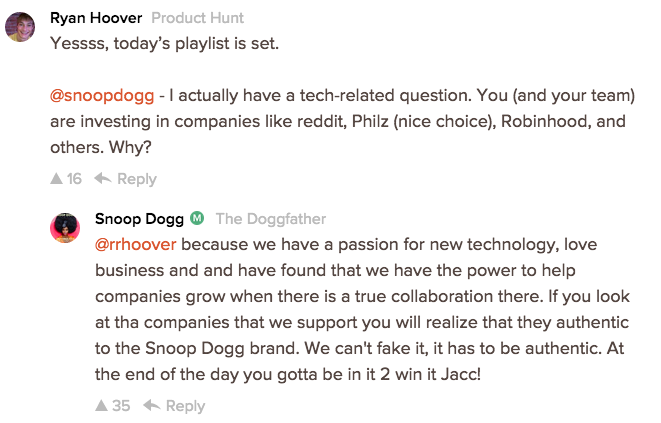 Hoover maintains there is some semblance of technology in an AMA with Snoop, however. “There’s a tech thread throughout this to some extent,” he told TechCrunch. He’s right in a way. Snoop has been an avid supporter of the site and has posted products there before. He’s also an investor in several tech companies like Reddit and the zero-fee stock trading platform Robinhood. He’s even raised money to create his own venture fund for marijuana startups. But Hoover agrees this is also a step toward a future Product Hunt that supports more than just tech. “Everyone is using technology extensively and other industries are being changed by technologies,” he told TechCrunch. He mentioned Snapchat as an example and said other technologies are influencing his mom and grandparents, too. But Hoover also sees a future where Product Hunt showcases and lets the community vote on products in every category. “Tech isn’t the only place things are being created every day,” he said. Many have postulated where Product Hunt is headed and how it might plan to move out of its loyal tech following and into other categories. Investor Kevin Rose, who told me a while back that Product Hunt reminds him of an early Digg or Reddit, was curious himself to see where the site is headed. “If anything it will compete somehow with Pinterest for product discovery. Who knows? Or maybe it will be its own unique thing and it doesn’t push anyone else out?” Rose wondered. Hoover is a smart dude and actively participates in the marketing and community building of the site – he still writes the company newsletter every morning. But growth and the change that comes with it is a hard thing for even the most intensely committed and intelligent CEO to handle. Digg learned the hard way that what appeals to Silicon Valley doesn’t necessary translate to the rest of humanity. However, Product Hunt may have an easier time than Digg did here. While the majority of ‘hunts’ are currently tech products, users are hunting and posting other cool stuff they see online, too. Hoover candidly mentioned his plans to add in music, books and entertainment to the site – he recently released a separate Product Hunt gaming newsletter. But Hoover cautioned that the transition to more verticals wouldn’t happen overnight. “We can’t take every category at once. We want to be strategic about what we take on,” he said. But it’s that tech audience that may also initially attract these products from other verticals as well. Nick Adler, one of Snoop’s managers and the head of the digital strategy for Cashmere, Snoop’s marketing arm, spoke with me over the phone about how the AMA and launch came together on Product Hunt – it was an ongoing conversation but ended up coming together in less than a week, he told me. 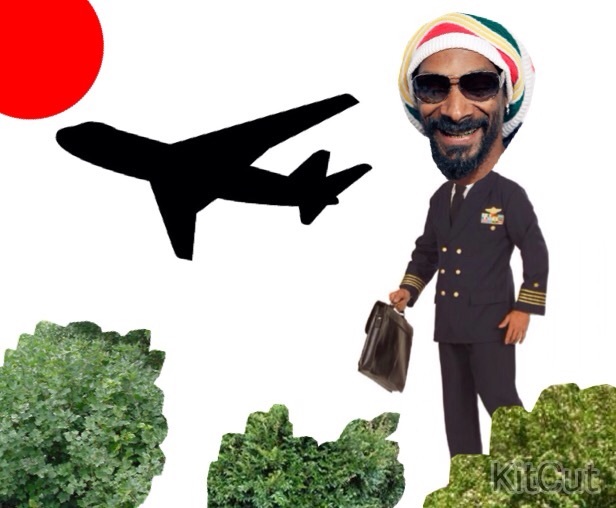 The Snoop album launch and AMA on Product Hunt was an experiment that Adler hoped would resemble one of several AMA’s Snoop has done on Reddit (a couple as Snoop Lion, one with 2 Chainz, one time he actually interrupted Will Ferrel’s AMA). “You know, people say ‘Oh Snoop, I love your work’ all the time, but you’d be surprised how many people say ‘Hey Snoop I loved your AMA on Reddit,” Adler said. Ultimately, Adler and the Cashmere team’s decision to do this had to do with the loyal tech audience on Product Hunt. Many artists struggle to stand out from the noise – even celebrity rappers like Snoop need to do their part. Adler believes the tech audience and the loyalty they have to Product Hunt would be one way to get ahead. “It’s that combination of the tech audience that we like to have a dialog with,” Adler told me on the phone from his Los Angeles office.. But Adler sees the potential to move beyond tech in the future. “The people engaged on Product Hunt are in the tech space but I think the audience is bigger than that, too,” he said. It’s too early to get direct album sales numbers from Product Hunt, though Hoover mentioned there were 2600 click-throughs to the album on Google Play within 5 hours of the AMA. A good product launch usually hovers around 12,000 to 22,000 clicks from the site within a 24-hour period, according to Hoover. Adler wanted to give it 5 or 6 days, but he mentioned the engagement had been overwhelmingly positive for Snoop so far. Product Hunt has held several other successful AMA’s – The Tim Ferris AMA held two weeks ago had 1092 upvotes and 108 comments. 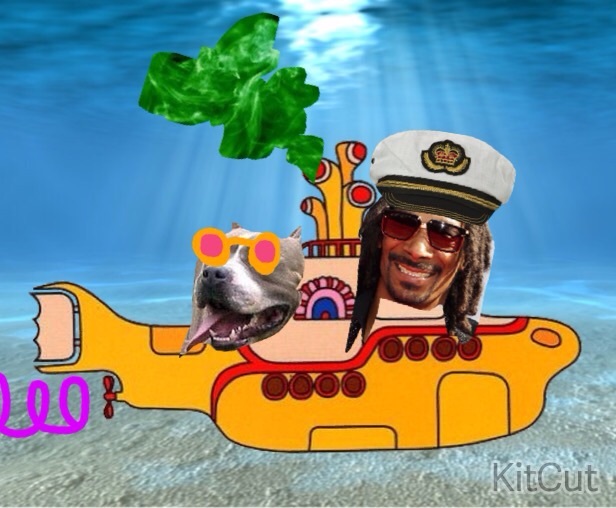 Snoops, by comparison, had 408 upvotes but nearly twice the comments. Hoover also added that the Snoop AMA has been one of the most tweeted Product Hunt AMA’s so far. “The engagement is higher on Product Hunt than typical,” Hoover said. But he added that the value may be more in the conversation than clicking through to buy Snoops new album. “People might go later to buy on iTunes,” he said. Only time will tell how well the AMA went, but it could be used as a litmus test for how Product Hunt proceeds into these other verticals in the future. For the here and now, Hoover and his team are focused on hiring more community leaders, “with people who have passions outside of Silicon Valley,” according to Hoover (read – people who can work with verticals other than tech).